Obviously everyone in the UK is still reeling a little from the snap election announcement. But it’s important to remember that democratic processes are not only exercised at the ballot box. Whatever happens on the 8th of June, we will need to work hard to build power and transform our culture to create the society we want. There is a lot of discussion within activist and campaigning circles about the differences between mobilising and organising strategies – I’ve written a lot about this here, especially in my post about Dr Hahrie Han’s research. It’s very exciting that now many groups and organisations are trying to move towards organising as a way to build power for our campaigns and escalate our movements, to complement the mobilising that is already happening. But understanding of organising approaches, and how they translate into NGOs and grassroots activism, is still at an early stage. We have a lot to learn. Setting up a culture that strengthens transformative movements – how you work with others and embed the values and relationships you want to see in the wider world in your organising. Learning the organising tools to grow our bases – developing leadership, conducting one to ones, all the basic tools you’ll need. Managing the transition to an organising approach – practical ideas for how this can be introduced in your group or organisation. These tumultuous political times provide the perfect opportunity for organisations and grassroots groups to re-think their strategy and try a fresh approach. It’s time to build alternative sources of power to win the world we want, rather than just targeting existing power structures with the same tired tactics. An organising approach is needed more now than ever before – to build power, sustain momentum, shift public opinion and seed a new culture. Why is culture so important? An increasing mass of people agree that long term human survival depends on us replacing the status quo with a fundamentally different set of behaviours and structures. I believe the root of that challenge is essentially cultural, and the best place to grow culture is in small groups. And until we’ve got a critical mass of activists that are embedded in a new way of thinking, relating and communicating, any mass movement is going to replicate the errors of the past. We’re motivated by the desire to help UK campaigning get more effective and build transformative movements that can win, from the bottom up. This is needed more than ever right now! We think there’s a need and a demand for campaigners to attend this. When and where and how much? We’re starting with two full weekend trainings in London. The first will be a pilot, testing out how best to run this, so the charges for this are cheaper than those at the later training – in return we’ll want to get detailed feedback from participants to help us evaluate and develop the training. We’re going to charge on a silding scale, and we want to keep a number of free places for grassroots groups. If we’re successful, we will apply for funding to offer more free places and to tour the training far beyond London. We can’t offer help with travel costs but might be able to find places for people to stay – we really want to minimise barriers to people attending. *Update* following the success of the two pilots in 2017, responding to high demand, we’ve launched the first of our planned trainings for the new year. 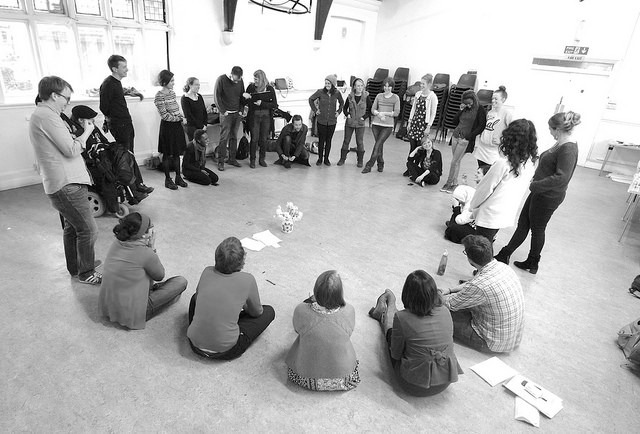 We’ve designed the training with two groups in mind – NGO campaigners at any level inside your organisation, and activists from grassroots groups, who think your work could be more effective if organising approaches were integrated into your approach. We’re a collective with decades of experience between us in running campaigns, community organising, developing strategy and training others. We’ve worked in the areas of social, economic, racial and environmental justice and mental health. Alongside our impressive practical experience, we’re influenced by (and have trained with) Hahrie Han, Carlos Saavedra, Jane McAlevey, and Training for Change. Tatiana Garavito is a migrant’s rights organiser/activist. Former director of the Latin American Women’s Service (LAWRS) and IRMO, two human rights organisations supporting the Latin American community in London. Tatiana currently works as the national organiser for communities of colour at HOPE not hate. Kat Wall is a trade union organiser/activist building coalitions and campaigns on the ground in Bristol. She has been a local organiser with the New Economy Organisers Network for several years, bringing together organisers, activists and campaigners working for social, economic and environmental justice to build capacity and support joint action. Kat is also a trained facilitator and draws on the teachings and traditions of Training for Change, Art of Hosting and Jane McAlevey. You already know about me! Probably… If you don’t you can read lots more about me on this blog, my bio associated with the training I’m organising at Ulex (exciting new training platform currently running a crowd funder, which I hope to blog about in more detail soon). I’m also on Twitter and Linked In. We’re asking people to apply if they’d like to attend either of the training weekends. The deadline to apply for the third training is February 16th at 5pm – You can apply using this short form. We will be running more trainings later in 2018 – we’re in the process of constituting so we can apply for funding to offer trainings around the UK and give more free grassroots places. We also offer a bespoke service to develop and deliver trainings for organisations.